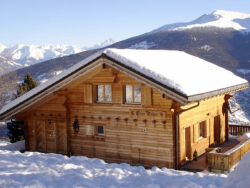 With easy access to some of the best skiing and snowboarding in Switzerland, Les Collons is a perfect place for an individual, group or family holiday! Getting up to the slopes is easy with four lifts rising out of the resort, and ski-in/ski-out chalets are available. The slopes themselves offer something for everyone, although the Four Valleys is best known for its off-piste which is great for experienced skiers and snowboarders in Les Collons (in fact, snowboarders flock to Verbier and the surrounding area which hosts international free-ride competitions). Beginners have a choice of ski schools offering private and group tuition, and gentle nursery slopes to practice on. If you're looking for alternative activities on the snow, then you can explore cross country trails or go tobogganing! Follow the link to read about a summer holiday in Thyon Les Collons. [short_description] => Modern luxury chalet in a superb central village location, close to main ski lifts and all facilities and with the most amazing panoramic views. Modern luxury chalet in a superb central village location, close to main ski lifts and all facilities and with the most amazing panoramic views.